Please note that Casual Visitor Pass Bookings are suspended until further notice. We apologise for any inconvenience. From 1 December 2015 Casual visitors will need to have pre-booked a (free of charge) 'Casual Day Visitor Pass' to be granted access to the resort property. This pass allows us to get a better handle on guest numbers so we can provide adequate staffing and facilities for all guests of the resort. The number of passes issued daily are limited, guided by the levels of guest occupancy at the resort. Boat or jet ski visitors will have a dedicated parking zone on the beach which will be closed to swimmers. This gives our resort guests and their families a safe feeling when swimming at the beach, whilst motorised watercraft can have an exclusive beach landing area whereby they also feel they are not hindering people swimming out the front of the resort. 4WD parking will also be available as per normal. Who needs a Casual Day Visitor Pass? Who doesn't need a Casual Day Visitor Pass? Timeshare Owners (and their immediate family only) can casually visit the resort throughout the year upon presentation of their membership certificate and photo ID to reception upon arrival. No further Timeshare entitlements are granted during such casual visits. There is no cost to the casual day visitor pass, although there will be a limit of no more than 6 guests per booking (subject to availability). Casual day visitor passes will need to be booked the day prior to arrival and no more than one month in advance (subject to availability). Upon arrival at the resort, the entire travelling party must take their casual visitor pass immediately to the resort reception for validation. In the interests of fairness and even distribution of the limited number of passes, a casual visitors can only visit the resort once in any seven day period .irrespective of whether the booking was made by themselves or a friend. Name, address and driver's licence/Passport number must be provided as part of the process of the booking and the same identification must be presented to the resort Reception desk upon arrival for the pass to be validated. Casual Day Visitor Passes will be valid between the hours between the hours of 8:30am and 6:00pm. Casual day visitors who have not booked a casual day visitor pass will be refused entry onto the resort's premises. All holders of a casual day visitor passes are subject to further terms and conditions that will be made available at the time of booking, and will be required to display evidence of their booking upon arrival. The above system will allow us to manage our guest numbers and to deliver all official resort guests and official day visitors a relaxing holiday at Tangalooma Island Resort. Where required, the resort will implement all necessary security measures for this policy to be implemented both efficiently and professionally. Where to park motorised watercraft or vehicles upon arrival? 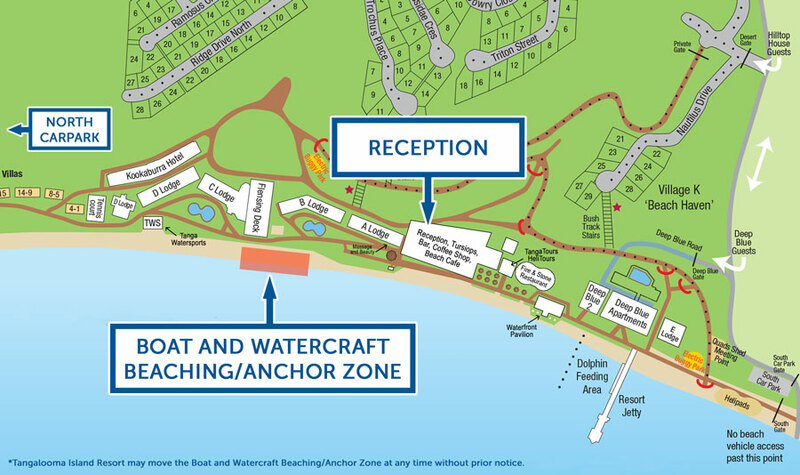 From 1st December 2015 all pre-booked casual visitors arriving to the resort in a motorised watercraft will be required to beach/anchor their vessels in designated landing zones (note that Tangalooma Island Resort may change the exact location of the landing zone at any time). Any pre-booked casual visitors arriving at the resort in their own motorised watercraft will be directed to use a new dedicated beach landing zone, that allows us to ensure our guests can feel safe in the water when swimming in other areas, and all people in motorised watercraft get a dedicated and exclusive beach landing area whereby they also feel they are not hindering people swimming out the front of the resort. This area will be signed as a no swimming zone for our resort guests and has been specifically set aside for our pre-booked casual day visitor's motorised watercraft. Pre-booked visitors arriving to the resort in a 4WD vehicle will be asked to use the northern or southern car parks as per normal. Can casual visitors still purchase meals & drinks from resort outlets? From 1st December 2015 casual visitors will be required to book a Casual Day Visitor Pass in order to access Resort Private Property or to purchase food or beverages from outlets at the resort. Castaways Café - located in the township of Bulwer offers casual dining only 100 metres from the beach. The Gutter Bar - located on the Southern end of Moreton Island, and offers meals and bar facilities. Both of these properties currently welcome casual day visitors, have road access, and terrific beach access. Both properties have similar facilities to those on the resort and offer a great destination for casual day visitors to experience the best of Moreton Island. Additionally the MiCat car barge sells a limited range of refreshments/ice and supplies onboard during the transfers to and from Moreton Island. Can casual visitors still purchase supplies/groceries from resort shops? From 1st December 2015 casual visitors will be required to book a Casual Day Visitor Pass in order to access the Resort Private Property to purchase supplies from the resort convenience store, vending machines, or bar. Visitors to Moreton Island without a pass are directed to purchase any such supplies from Castaways Store located in the township of Bulwer. The Castaways store is open 5-6 days a week depending on the time of year. Please note trading hours vary during peak and selected periods. You can buy all your holiday essentials including fuel, firewood, ice, bait, gas, alcohol, a selection of grocery items and basic recovery gear. At Kooringal, The Gutter Bar acts as a convenience store selling milk, bread ice and a selected range of general groceries. Can casual visitors book activities, tours, or watersports equipment at the resort? From 1st December 2015 casual visitors will be required to book a Casual Day Visitor Pass in order to book or participate in any organised tours, activities, or to hire watersports equipment from resort operators. As per the existing policy, casual visitors are also unable to participate in our evening dolphin feeding program. Why are we making changes to casual visitor access? We are very aware that many residents from the South East QLD region visit the resort casually and enjoy the local environment and surrounds. However as a privately owned commercial business we must have the ability to manage our own guest expectations and deliver to these guests' great holiday experiences. With uncontrolled numbers of casual day visitors visiting the resort this has become increasingly difficult to do. We must be able to plan, roster and manage the expected number of guest arrivals that we are fortunate to have each day. With this in mind we will be introducing a new 'casual day visitor pass' so we can operate effectively and deliver on our customer service promise. All of these concerns have been regularly escalated by official resort guests to our management team, and are exacerbated on days coinciding with large influxes of casual day visitors on the resort. As such Tangalooma Island Resort has changed this casual visitor access policy as part of our commitment towards delivering exceptional holiday experiences for all of our official guests. Over the past few years it has become more difficult to manage and cater professionally for our official resort guests due to high volumes of casual day visitors that arrive by way of 4WD vehicles and camp in the adjacent National Parks area or arrive by private watercraft. There is no way for the resort operations team to know what numbers of casual day visitors will arrive on any given day - therefore it is not currently possible to be able to efficiently have adequate staff rostered for work, adequate supplies for guests to be stocked and our range of tours and activities to be efficiently operated due to vastly ‘moving' numbers of overall visitors to the resort. We can control the numbers of our official guests visiting the resort by way of occupancy in overnight accommodation properties and the availability of seat capacity on any of our scheduled day cruise vessels, and manifests of visiting cruise ships. We can manage guest numbers both up and down depending on our operational commitments, staffing capabilities, and as to what guest activities we are operating on any given day.We will now extend this system to incorporate the casual day visitor pass (see below) to ensure we can have full control in terms of the total numbers we can accommodate at the resort on any given day. Tangalooma Island Resort is a privately-owned company and is located on private property. The resort's infrastructure is limited in capacity and has been designed with the purpose of catering for the needs of our official guests. Over the course of the past five years Tangalooma Island Resort has invested substantially into the resort facilities to cater for our range of tourism markets and continues to enjoy solid growth in guest visitor numbers. The resort has been developed with the intention to be able to cater for our mix of guests from both the domestic and international markets, and for those guests choosing to stay for overnight holidays or visiting the resort on one of the many official day cruises that are offered. Limited lounge seating options around our resort swimming pool areas.